讓所有台灣長大、愛台灣鄉土的我們，無論在海內外或世界任何角落，不分黨派，籍貫，職業、性別，一起來關懷 “她” 罷！“團結就是力量；真理越辯越明！” God Bless Taiwan ! https://www.facebook.com/events/883577485027812/  Join Cafe Philo @ Boston, "Tears"
tolerate and forgive human errors and mistakes? also the opening film for the 2009 Taipei Golden Horse Film Festival. Fu-Kai obtained his PhD at Rutgers University in New Jersey. He currently works as a postdoctoral fellow at MGH/Harvard Medical School. social issues through this platform. ave” in Cambridge for your smart phone map apps. Tickets will be available for purchase after 11/24 at New York Taiwan Center and various locations. Please call 718-445-7007 to find out where tickets can be purchae in person for each screening location. Tickets can also be purchase online through beyond-tw.eventbrite.com . Please follow FBlink on https://www.facebook.com/events/310009772536633/?ref=4 for future announcement on screening event detail and ticket purchase. Parking $7.00 at https://www2.uos.harvard.edu/cgi-bin/permit/purchase.pl You need the department & department code: Harvard Real Estate-Resident 9012 and your car plate number to purchase the permit. Wednesday, 12/10, 《看見台灣》美東放映與齊柏林導演座談會 with two flyers, one from New York one for Boston. be the MFA’s current exhibition "Goya: Order and Disorder." tour. Maximum 25 people accepted. will be the first few to learn about this project. North America in a quarter century. It is on view only at the MFA. 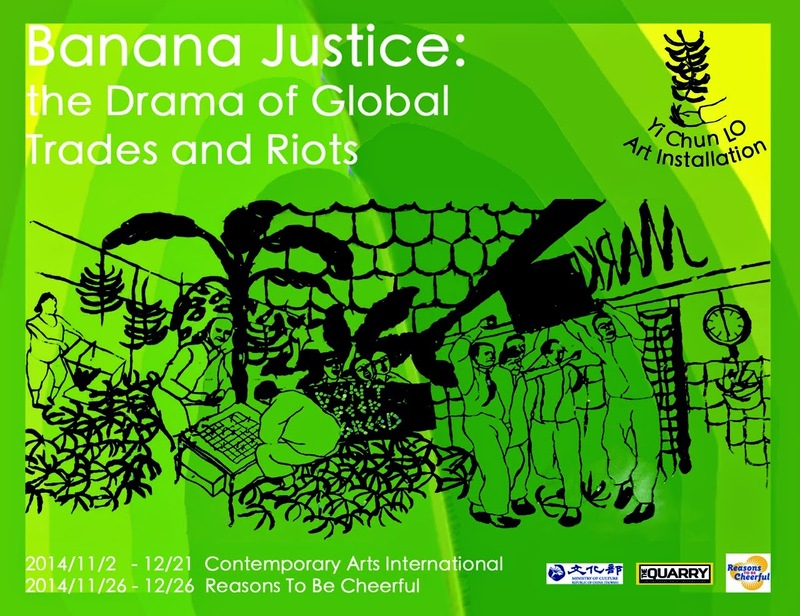 Acton, MA (Nov 2, 2014) – The Contemporary Arts International is pleased to present a gallery exhibition, “BANANA JUSTICE” – the Drama of World Trades and Riots by Yi Chun Lo, from Nov 2 to Dec 21, 2014. An preview reception will be held on Sunday, Nov 2, 1:00pm – 4:30pm. An Artist’s Talk is scheduled at Sunday Nov 16, 4:00PM. Gallery Hours are Thursday, Friday, Saturday and Sunday (1pm—5pm) and by appointment (call 617-699-6401 or email ypeet@verizon.net). !This show features the work of Yi Chun Lo, an outstanding international artist who was selected by the Taiwan Ministry of Culture to take a 6-month residency at CAI. Lo effectively uses her artwork as a vehicle to carry on a dialogue with the environment she is in. This project using the “banana peels” as her paint has indeed demonstrated how quickly she was able to initiate her contact with the community (which is foreign to her) within the first few weeks of her residency in Acton, and get them involved in her project. CAI will be holding an Artist Talk at 4PM on Nov 2nd to give the audience a chance to discuss with Lo her approach to the creation of art. (countries in Central & South America that have been cooperating with the international fruit companies). 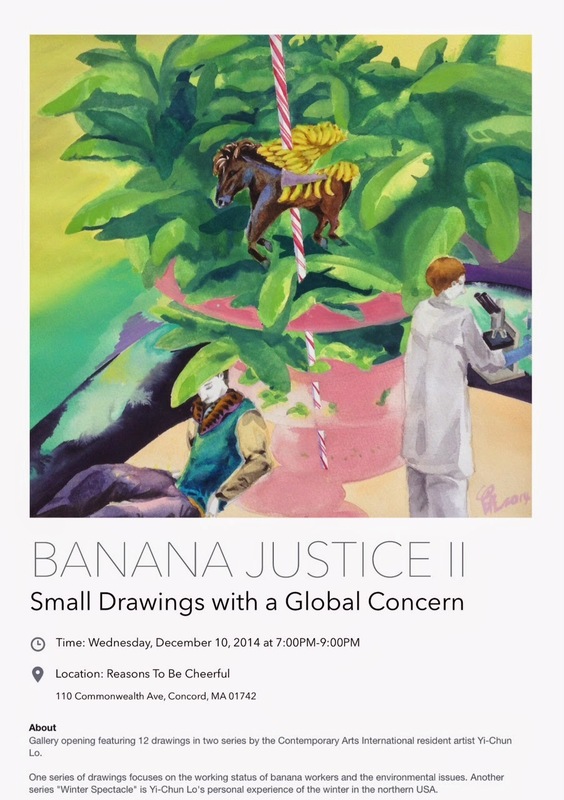 As the investigation goes on, she comes to realize that the first international fruit company in the US, United Fruit Company, was established in Boston, a site of her artist-residency; furthermore, she learned about the 1929 banana massacre in Colombia, the farming impact of banana farming to the rain forest, how the capitalists dictate banana trade in Central America and the issue of labor exploitation. Thinking how ironic that the banana, being one of the most nutritious foods to humans, turns into one of the most controversial objects in the world economy and social justice, Lo decided to use banana peels, an organic and basic medium, to create a “beautiful picture” of the bloody massacre. Contemporary Arts International (CAI), a 501(c)(3) non-profit, is located at The Quarry, a 12.9-acre site at 68 Quarry Road, Acton MA. The mission of CAI is to promote sculpture, music and interdisciplinary art in a global context through symposia, international artist-in-residency programs, exhibition events, and educational outreach. ! The CAI Co-founders Yin Peet and Viktor Lois, originally from Taiwan and Hungary, respectively, both have extensive international experience and connections in the art world. Yin Peet is a sculptor and performance artist, who earned an MFA in sculpture from the Massachusetts College of Art and Design. Viktor Lois is a kinetic sculptor and sound artist whose work is displayed in the permanent collection of the Ludwig Museum of Contemporary Art in Budapest, Hungary, and an entire building in the Mine Museum compound (Tatabanya Museum, Hungary). At the CAI, granite and kinetic sculptures are situated throughout The Quarry, as well as in the Red Box Building, which includes gallery space, a classroom and a performance stage, Container Man, a large-scale kinetic musical sculpture located in the Red Box Building. Lois, Peet and guest musicians perform concerts on this remarkable sculpture. ! Acton, MA (Nov 2, 2014) – Contemporary Arts International is pleased to present an exhibition and concert of the permanent collection in the upstairs Gallery by Viktor Lois. The concert will be presented as a series of mini-play demonstrations starting Nov 2 (5PM), leading to the “Concert with composition” on Nov 15 (5PM) and Nov 16 (5PM). The ticket of $20 applies to the entire series. Tickets are limited because the Music Altar is in an intimate setting, and we only have 25 seats for each show. Advanced reservations are highly recommended. Tickets can be purchased at the door on a first-come-first-serve basis. To reserve a ticket: mail a check to CAI, call 617-699-6401 or email ypeet@verizon.net *Due to weather, Nov 1 (Sat) concert is canceled. “...a mechanical genius, Lois strives to develop a new folklore that nestles upon post-industrial revolution, post-modern individualism... the outcome is complex, enigmatic and irrationally romantic...." (1992 comment by art critic Konkoly). Lois started making art in the 1970s. At great risk of Communist repression, he opened the first private gallery in Tatabanya, his birth city, showing avant-garde sculpture and experimental performance work and articulated his critical viewpoint of the consumerist mentality. In the 1980s he exhibited a series of mechanical kinetic sculptures that brought him acclaim and fame in the kinetic world, bringing comparisons to Jean Tinguely. Lois doesn’t simply compose artwork from the recycled, deserted machinery he finds, he transforms the function of the machine into artistic movement as well as music. By the end of the 1990s, he had created more than 150 musical instruments, a body of work that best represents the artistic fruit produced under the socio-political background of the previous two decades in Central Europe. In 1993 he represented Hungary to participate in the 45th Venice Biennale. In 1996 the Hungarian government designated a building in the Tatabanya Museum compound for Lois’ collection. Lois' exhibitions have been acclaimed in major museums and galleries throughout Europe. Viktor has immigrated to the US in 2006 and resides in the Boston area. Together with Yin Peet, they created the CAI Art Grounds. 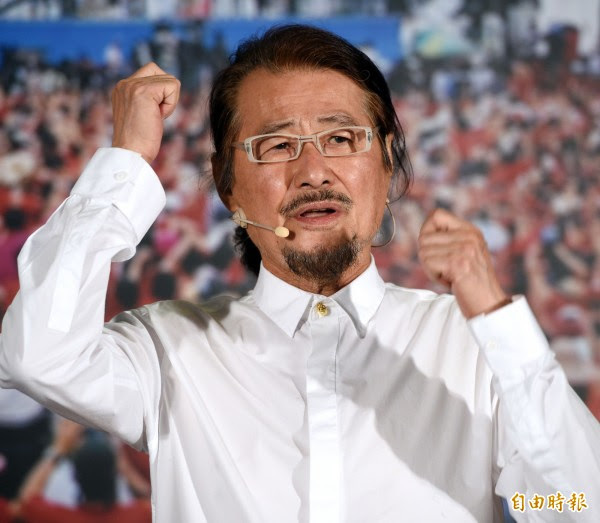 Currently, he is the Artistic Director of CAI. Music Altar is a masterpiece of Lois’ 25 years of instrument making. It was conceived in 1999-2000 at the height of Viktor’s maturity in instrument making, and a result of his nearly 150 pieces of instrument making experience. The system as designed is stereo, in contrast to the current digital world. The Music Altar strives to be down-to-earth “physical”; it consists of a total of 24 instruments, including all elements in an orchestra, i.e., bass- percussion, keyboard guitar, two-necked fiddle, motorized violin, conga-bass, double bass, singing/vocal instruments with effects, stringed heart instrument, motor guitar, mandolin, and a wind-trumpet instrument. !Contemporary Arts International (CAI), a 501(c)(3) non-profit, is located at The Quarry, a 12.9-acre site at 68 Quarry Road, Acton MA. The mission of CAI is to promote sculpture, music and interdisciplinary art in a global context through symposia, international artist-in-residency programs, exhibition events, and educational outreach. !The CAI Co-founders Yin Peet and Viktor Lois, originally from Taiwan and Hungary, respectively, both have extensive international experience and connections in the art world. Yin Peet is a sculptor and performance artist, who earned an MFA in sculpture from the Massachusetts College of Art and Design. Viktor Lois is a kinetic sculptor and sound artist whose work is displayed in the permanent collection of the Ludwig Museum of Contemporary Art in Budapest, Hungary, and an entire building in the Mine Museum (Tatabanya Museum, Hungary). At the CAI, granite and kinetic sculptures are situated throughout The Quarry, as well as in the Red Box Building, which includes gallery space, a classroom and a performance stage, Container Man, a large-scale kinetic musical sculpture located in the Red Box Building. Lois, Peet and guest musicians perform concerts on this remarkable sculpture. Come see the WORLD PREMIERE of DESCENDANTS OF THE PAST, ANCESTORS OF THE FUTURE at the 2014 Boston Asian American Film Festival! The film's star, GOLDEN GLOBE, EMMY, and DRAMA DESK nominee TINA CHEN, is scheduled to be in attendance! Synopsis: Andrew (Albert M Chan), the son of Chinese immigrants, is about to become a father to a baby girl. Before she is born, however, Andrew desperately needs to understand how his mother Ellen (Tina Chen) and her own father could have lived apart for most of their lives. There is an exciting event coming to Boston. Would you please help us to post the following information on your newspaper or online news at your early convenience? We'd like to invite more people coming to join this special event. Thank you very much for your great help! Below is the info and Please also see attached poster for more detail.